This review is of the cut shown at the BFI London Film Festival in October 2016 – as of this review, there is no UK release date yet for this movie. In horror movies, dead bodies are either flesh-eating zombies, or rotting on-camera to give off that extremely disconcerting vibe. So rare is it that a corpse remains mostly that throughout an entire film of its kind, particularly one where it’s the main threat, and even rarer that its complete lack of doing anything obtains more chills than if it were to ever become mobile once more. Such is the case with The Autopsy of Jane Doe, the English-language debut from Norwegian director André Øvredal, which is an entertaining horror that gets the job good and done, especially when it attempts to make non-moving dead bodies scary (though, after Swiss Army Man, probably not nearly enough farting and propelling across water like a jet-ski for my tastes!). 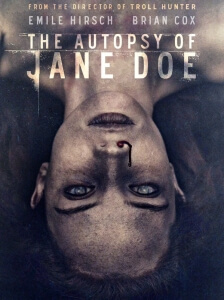 Said “Jane Doe” is the unknown female body found buried underneath the house of a crime scene, and is swiftly taken to father-and-son coroner team Tony and Austin (Brian Cox and Emile Hirsch respectively) for an immediate autopsy. For them, it begins like any other corpse examination, although Austin has reluctantly had to cancel a night out with his girlfriend Emma (Ophelia Lovibond) in order to stay and help his father. However, as they make one disturbing discovery after another about the body – from her tongue having been cut out, to her internal organs showing signs of burns and stab wounds despite no bruises of any kind on the exterior – things slowly start to unravel, and soon they are both drawn into a frightful battle with something that is most certainly dead… or is it? This is the kind of horror movie that would definitely show up as a midnight showing during a horror season at a local independent cinema, and I mean that in a good way. It has a pulpy throwback kind of vibe to it, one that could easily have been made back in the 70s or 80s (albeit without the instances of modern day technology used here) as an alternate double-feature with something like Gremlins. While this movie doesn’t have that much in common with that one (unless there was a rule I missed about not feeding the corpse after midnight), both are still pretty scary, sometimes darkly funny, and always entertaining as hell from start to finish. This film was shown as the “Cult” gala for the London Film Festival, and you can see why; Øvredal has made a horror film that is not only likely to earn a niche audience over time, but also earn some serious points from critics for its smaller and thus more claustrophobic feel to it, adding to the suspense as well as the surprising emotional layer. Because it is such a limited cast, of up to about five or six speaking parts, that allows us more time to get to know these people and develop a connection with them, no matter how small. Cox and Hirsch have a genuinely sweet mutual respect for one another on-screen, and both of them work off their easy chemistry with each other to deliver performances as characters you actually do want to see come out alright in the end. Other actors like Lovibond and Game of Thrones’ Michael McElhatton, who bookends the film as a police detective, make the most out of the small parts they are given, but the real standout is Olwen Kelly as the Jane Doe. Although she plays a corpse throughout the entire movie, the relative newcomer brings chills aplenty without even moving a single muscle of her body, and there’s something about her still nature and – if you’ll excuse the pun – doe-eyed blank expression that really sends a shiver down the spine, particularly whenever the film gives us a close-up of nothing other than her dead face. There are times when the film can go a little over-the-top in some of its ideas and motifs – let’s just say that Jane Doe isn’t the only corpse in this mortuary – while there are plot turns which might not make much sense when you understand the context surrounding it, but I found The Autopsy of Jane Doe a more entertaining sit than I had previously thought it would be. It might not be an instant classic, nor even a major milestone in the self-declared horror renaissance that’s going on right now, but it’s bound to be a future midnight favourite for horror fans. The Autopsy of Jane Doe is an entertainingly spooky film that delivers an appropriate amount of scares, suspense and solid performances for it to become a future midnight horror favourite for cult audiences.